Why is it getting hot and ugly this summer in the Great Plains? Anti-energy protesters are trying to stop a pipeline that will create 12,000 construction jobs. August temperatures aren’t the only things flaring up in the Great Plains as anti-energy protesters try to stop construction of an oil pipeline. Emboldened by President Barack Obama's rejection of the Keystone XL pipeline in 2015, anti-energy protesters have set their sights on stopping the Dakota Access Pipeline. A valuable addition to U.S. energy infrastructure, the pipeline will cross four states connecting the oil-rich Bakken region in North Dakota with other pipelines in Illinois, allowing oil to reach refineries and making America less dependent on foreign imports. 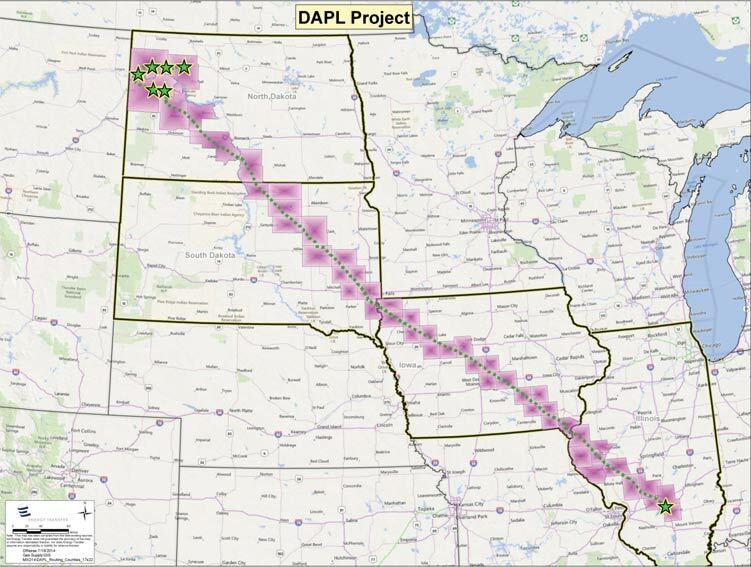 Route of the Dakota Access Pipeline. Source: Energy Transfer Partners, L.P.
Energy Transfer Partners, the company building the pipeline, says the $3.7 billion project will create 8,000 - 12,000 construction jobs and inject $156 million in sales and income taxes to local economies. Lachlan Markay at the Washington Free Beacon notes it has the backing of the Laborers’ International Union of North America (LIUNA). Approval of the pipeline’s construction went through the standard process of public hearings and comment periods with four states and the federal government. But the public permitting process hasn’t stopped protesters. In North Dakota, hundreds of protestors—many not from the area--have built a camp near a construction site where the pipeline will travel under the Missouri River near the Standing Rock Sioux Reservation. The Army Corps of Engineers approved the pipeline’s water crossing there in July. The protests have turned ugly. Local public radio reports that construction has been halted because law enforcement worried that some protesters had pipe bombs and guns. Dozens have been arrested for trespassing and disorderly conduct. The FBI is investigating an incident where someone pointed a laser pointer on a North Dakota state government plane that was watching the protesters. North Dakota hasn’t been the only place where violence has broken out. Earlier this month, along the pipeline’s path in Iowa, three arsons were committed, damaging $1 million in heavy construction equipment. Protesters argue that the pipeline will threaten local water supplies, but the fact is pipelines safely move oil all the time. A report from the American Petroleum Institute and the Association of Oil Pipe Lines finds that 99.999% of crude oil and petroleum products are safely delivered. In 2014, 9.3 billion barrels of crude oil were delivered—a 31% increase since 2010. While more oil has been transported, there have been fewer spills. “The number of pipeline incidents per year in public spaces (i.e. outside of operator facilities) have declined by more than half since 1999,” the report notes. What’s more, pipelines aren’t a new thing. Hundreds of thousands of miles of pipelines every day safely move energy to households and businesses that need it. For instance, the amount of crude oil pipelines has increased by 29% to 72,400 miles in the last five years. Source: U.S. Department of Transportation. Given that pipelines have been around for decades, have a strong safety record, and the Dakota Access Pipeline was closely studied before receiving its permits, we should wonder what the protests are really about. The protesters say the pipeline, which crosses the Missouri River at its confluence with the Cannon Ball river near the reservation, puts clean water at risk. 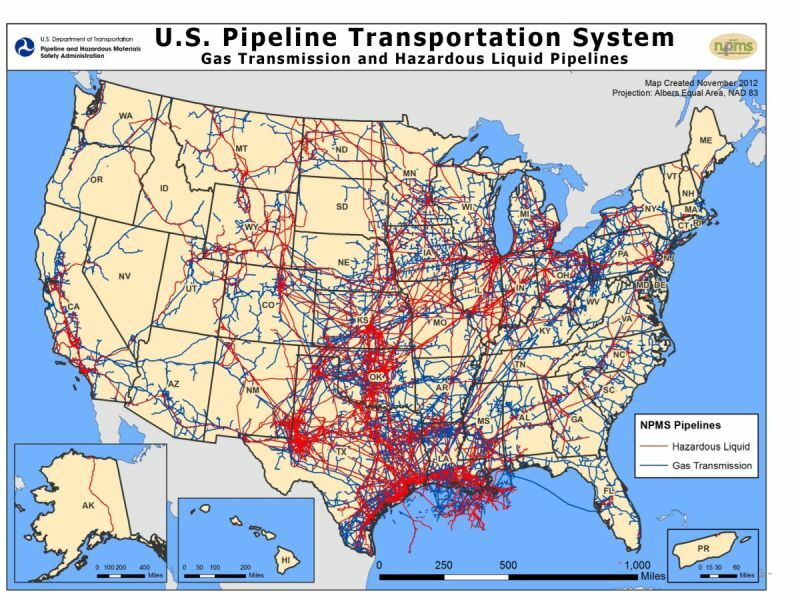 That’s certainly an important issue for the reservation, which draws its drinking water from the river near the pipeline crossing, but it’s worth remembering that the American landscape is dotted with pipelines crossing rivers. There are thousands upon thousands of pipelines in America, and building them would have been impossible if we didn’t know how to get them across rivers. Which makes the claims of the protesters about the Dakota Access project curious. This project is nothing new. It’s an important bit of infrastructure for America’s renewed energy industry. It’s of particular importance to North Dakota’s oil industry in that it will ease oil transport headaches and make development in this state more resilient to low prices. As new infrastructure, it’s a game changer. But in terms of its actual construction? This isn’t groundbreaking stuff. The activists air-dropping into North Dakota from all over the country, and even the world, are not anti-pipeline so much as they’re anti-oil. That’s an important distinction. While it may be within the realm of the reasonable to protest a specific infrastructure project, I think most Americans would consider trying to choke the domestic oil industry to death by blocking infrastructure to be an extreme goal. Don’t believe me? Consider the website for EarthJustice, an activist group which has filed a lawsuit against the pipeline on behalf of the Standing Rock tribe and is currently seeking an injunction to block legally the on-going construction protesters like Woodley are trying to block physically. Block the infrastructure, block the development. The “Keep it in the ground” movement rears its head, not that they're their hiding that fact. Bold Alliance founder Jane Kleeb, one of the ringleaders in opposing the Keystone XL pipeline, told Politico, "What should have happened after Keystone got rejected was a huge influx of resources to local and state groups fighting pipelines." Stopping the Dakota Access Pipelines and making it more difficult to get oil out of the Bakken—no matter the cost to jobs and energy security—is a means to their radical end of eliminating energy use in the U.S.